Well Defined was left alone to dictate the pace of the $250,000 Sam F. Davis (G3) on Saturday and refused to stop. 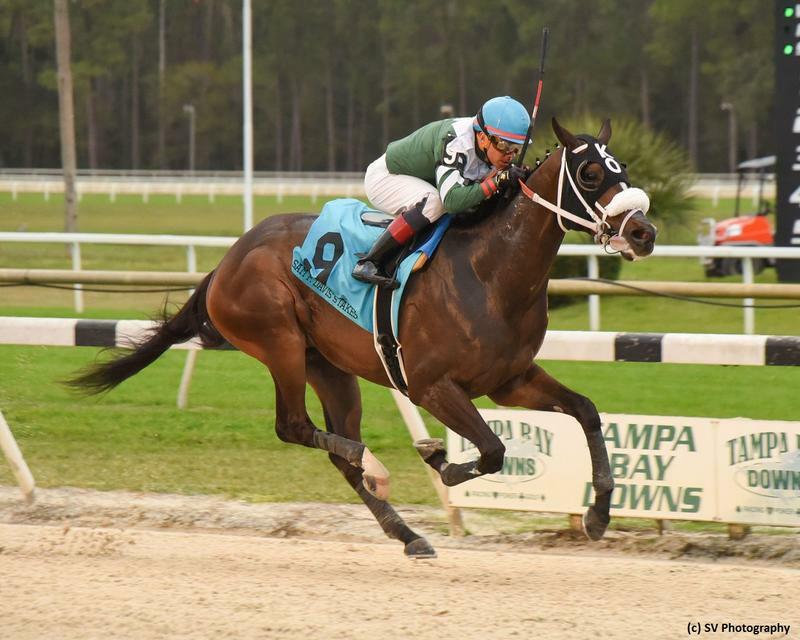 Wearing blinkers for the first time, the With Distinction gelding maintained a clear advantage throughout to spring a 7-1 upset in the Road to the Kentucky Derby series prep at Tampa Bay Downs. Setting fractions of :23.23, :47.09, and 1:11.68, Well Defined had plenty left under Pablo Morales to hold off second choice Kentucky Wildcat by 2 3/4 lengths in a time of 1:42.70 for 1 1/16 miles on a fast track. It was more than eight lengths back to So Alive, who raced more than a dozen lengths behind the lead most of the way. Longshot Counter Offer nosed out 19-10 favorite Knicks Go for fourth. "I didn't feel like I was going that fast at all," Morales said. "My horse was going as comfortable as he possibly could. I knew he was doing it relaxed and very much on his own. I had a lot of horse going into the second turn, so I figured I was going to ask him a little more and not wait for them to get me. If they were going to catch me, they were really going to have to come running." Bred and owned by Stonehedge LLC and trained by Kathleen O'Connell, Well Defined paid $16 and earned 10 Kentucky Derby qualifying points. Kentucky Wildcat, who was vanned off after the race due to a suspected knee issue, earned four points. So Alive earned two points, and Counter Offer one point. Well Defined made his first four starts at Gulfstream last season, winning the In Reality division of the Florida Sires Stakes and placing second in the Affirmed division. However, the Florida-bred retreated to 12th in the Breeders' Cup Juvenile (G1) and was a lackluster fifth in the $100,000 Mucho Macho Man in his season opener at Gulfstream on January 5. "He's had little things that have happened and he's grown up mentally and physically, and today he showed up with his game face on," O'Connell said. "His rear end slipped out from underneath him in the Breeders' Cup Juvenile and he was compromised on early position when he ran in the Mucho Macho Man and got bottled up inside, but he's a young horse who is improving, mind-wise and everything-wise." An earner of $490,570, Well Defined is the first stakes winner produced by the Medaglia d'Oro mare Fru Fru.